Stock #2937:1 or 1 1/2 Carat Moissanite in Bezel Slide Necklace. 14K Gold Bezel on 1 mm 14k Snake Chain Very Nice, Heavy piece!!! solid sides (not open like 6515) Nice Charles & Colvard Moissanite! 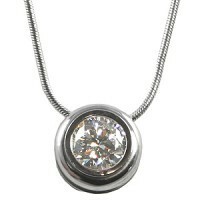 16 in chain recommended for this style pendant. Also available in Solid 14k White Gold.